The ominously named Tombland in the heart of Historic Norwich is home to the Maids Head Hotel. A Grade II listed building that claims to be the oldest continuously operating hotel in the United Kingdom. With over eight centuries of history behind it, it is only fitting that this timeless hotel be home to two very active ghosts. Comprised of six different interconnecting buildings, the Maids Head Hotel dates back to the early 13th century. The hotel is an eclectic mix of architectural styles that reflects its long and illustrious history. It’s believed to sit on a much older foundation that was once owned by the early bishops in the days of William the Conqueror. If so, this predates the history of the building by well over a century. Throughout its history as a place for weary travellers, the Maids Head Hotel has welcomed several notable guests among their clientele. In 1359, the eldest son of King Edward III, Prince Edward known as ‘The black prince’ was a frequent guest. As well as Cardinal Wolsey and Catherine of Aragon. And the hotel’s most famous guest, Queen Elizabeth I slept here one night during her reign in the room that is now called the Queen Elizabeth Suite. And lastly, to add to the mystique of the hotel, the Maids Head was home to Norwich’s first Masonic temple. The Maids Head Hotel, in Norwich, is known for its paranormal activity. For many years this historic Norwich hotel has been known to be haunted by two active ghosts. And due to this the hotel has become a popular haunt for local paranormal enthusiasts looking to have an encounter with the other side. Over the years several guests have reported the phantom of an elderly maid moving about the halls and corridors of the hotel. She is typically described as a woman in her mid to late 60s, wearing an outdated grey maids uniform. The grey maid, as she is called, is said to appear in the bar area and proceeds to walk around the hotel seemingly going about her daily chores. Wherever this phantom roams it’s been reported that the overwhelming smell of musty lavender is left in her wake. She then returns to the bar area and vanishes as she walks down the stairs to the basement. The grey uniform she wears was common during the 17th and early 18th centuries, so putting a name to this spirit is somewhat difficult. Guests and staff have reported encountering the unpleasant ghost of a very grumpy old man. This grumpy old man is most often seen in the courtyard shaking his head and mumbling to himself. Almost as if he is disapproving of something. He has also been seen walking through the halls of the hotel, angrily shaking his head. 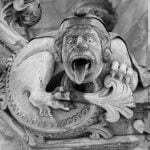 It’s believed this unpleasant entity was a former mayor of Norwich who was known to have an irascible disposition. He only appears for a few moments and fades away before the stunned eyes of onlookers. Staying at the Maids Head Hotel is like taking a step back in time to medieval England. The hotel offers 84 tastefully decorated en-suite rooms with all the amenities you would come to expect from a modern, luxury hotel. The Hotel’s award winning Winepress restaurant prides itself in offering locally sourced produce and a menu sure to delight any diner. And to compliment the menu, the restaurant has a wide variety of wines and spirits. The hotel also has the space to accommodate both conferences and weddings. 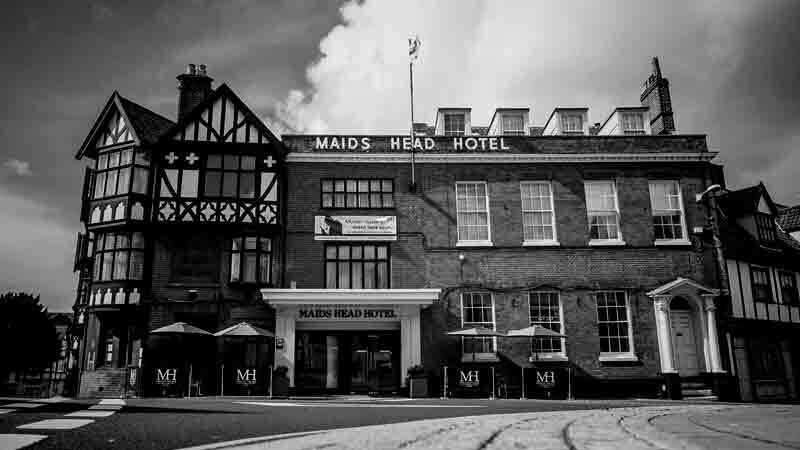 The Maids Head Hotel is ideally located in the heart of historic Norwich. Walking tours are given daily. Or you you can explore the cathedrals, churches and the Victorian and Tudor architecture that dominates this ancient picturesque city.